TASK 1:You should spend about 20 minutes on this task. 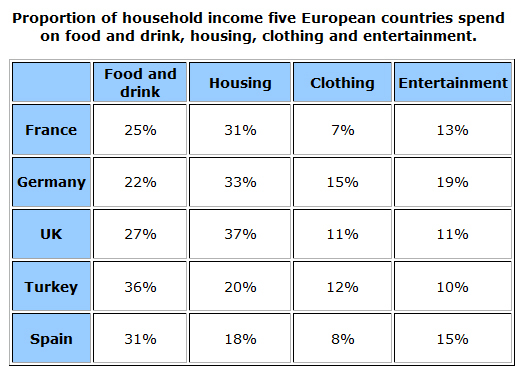 The table illustrates the proportion of monthly household income five European countries spend on food and drink, housing, clothing and entertainment. The table indicates data on the percentage of budget, which residents in five nations spend on food and drink, housing, clothing and entertainment every month. Overall, people in 5 European countries spend on food and drink and housing significantly more than remaining categories, while citizens in the UK pay the same proportion for clothing and entertainment. Of the five countries, Spanish and Turkish households spend the highest proportions of their income for food and drink, at 31% and 36% respectively. 27% of UK households budget pay for this items, compared to 22% in Germany and 25% in France. By contrast, individuals in all of five nations spend the highest percentage for housing monthly. In France, Germany and the UK people spend more than 30% of their income for housing, at 31%, 33% and 37% respectively. However, this figure for Turkey is 20% and only 18% for Spain. In a month, Germany is the country, which spends most in clothing and entertainment, at 15% and 19% respectively. Besides, both the UK and Turkish people pay over 10% for clothing, at 11% and 12% correspondingly, compared to only 7% by the French citizens and 8% by the Spanish citizens in the same item. The people in the UK pay the similar proportion for entertainment, at just 11%, while the figures are 15% for Spain, 13% for France and only 10% for Turkey. Pham, please remember that your noun phrase must represent the proper number reference for your item. In this instance, you said "This items", with items being a plural form. Therefore, the plural form "these" should be used to reference the items to prevent an incorrect noun phrase, hence "these items". Such a mistake will be considered an error that can lower your GRA score. By the way, the Task 1 essay should have a 4 paragraph format. The trending sentence can be made a stand alone reference sentence in situations where it is warranted, such as in this presentation. You should not have combined the trending sentence with the opening summary paragraph. Instead, you should have included a reference to the given instructions for the essay so that the reader will know what information will be discussed and how. In addition to that, the inclusion of the discussion instructions as a paraphrase will help you develop an outline for your discussion. That missing sentence is what forced the 3 paragraph error in your presentation. That is easily avoidable in the next practice essay. By the way, you have written too many words for this essay. You only have 20 minutes to write, review, revise, and finalize this essay. So the most you can write, in hand-written form will be no more than 175 - 200 words. Always leave some time for editing and always practice your task writing using a timer. You will learn, through that method, exactly how many words you are capable of writing within 20 minutes. Through repetition, you will find that you will always be writing just the right number of words to allow you to revise the essay later on.